At Branch and Lee Consulting Ltd, we are incredibly proud of our work and all our clients are very important to us. We are so confident that the services we provide are effective and carried out with such professionalism, that any of these Authorities can be contacted at any time in order to substantiate the results of the work undertaken. In fact, upon completion of each Housing Benefit Project, we continue to interact with our clients to ensure they are completely happy with our services. This has proven to be an effective way of building strong relationships and understanding that guarantees our consultancy firm and our clients businesses become more successful, year on year. “Camden Benefit Service has used Branch and Lee for two years running to carry out a pre-audit check of our subsidy claim. Their work has ensured we claim our correct subsidy and on both occasions led to a significantly higher subsidy payment. Their reports on likely areas of subsidy area have enabled us to improve the training and quality control of our own staff. This in turn has lead to fewer errors and reduced the risk of our subsidy claims being qualified in the audit process. “I was very impressed with the prompt and professional service provided by Branch and Lee. In terms of output and quality of advice they exceeded expectations and were better than a lot of the bigger firms of consultants and accountants that have previously done project work for the authority. Most importantly their work generated substantial additional income for the authority”. “South Tyneside Council have used Branch & Lee for the past two years to maximise the Benefit subsidy claim. The assistance provided by them is invaluable, particularly in the current economic client where any additional income identified is a bonus. The excellent results we have received are due to Philip and Joram’s excellent knowledge and exceptional professionalism. Their work is carried out without any interference to normal day-to-day duties and the report and working papers left are invaluable to ensure that improvements continue each year thereafter. This service is highly recommended”. 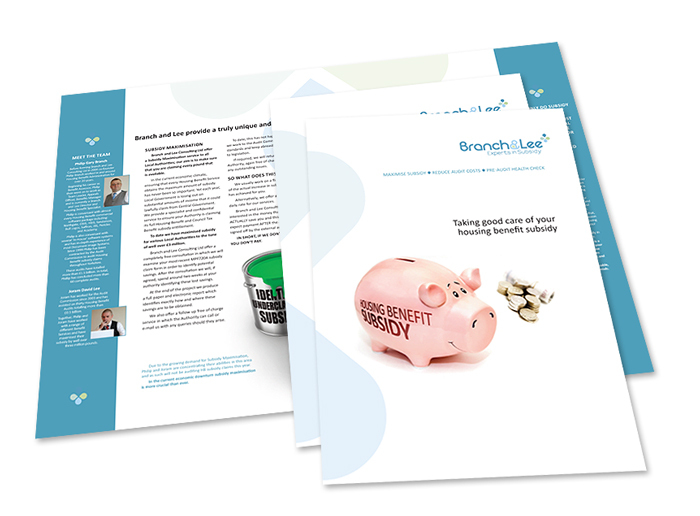 “Medway Council has on three separate occasions successfully used the consultancy services of Branch and Lee Consulting Ltd in maximising its Housing Benefit and Council Tax Benefit subsidy. The results were impressive with much needed additional income now totalling over £250,000 being identified. Further benefits included the fact that it gave us confidence going into forthcoming audits, auditors accepting the testing already undertaken, invaluable work concerning both Performance and Benchmarking and identification of training needs. The service is highly recommended and I would definitely consider using their services again”. “They brought with them a professional and personable approach as well as valuable auditing experience which they applied to their work, resulting in persuasive and effective working papers that were accepted by our own external auditor. They were also able to target their resource at those areas which had the highest impact to the authority. Branch and Lee enabled Thanet DC to maximise its subsidy income in two key areas, resulting in a net increase in subsidy due of around £290K. They represented an additional level of skilled resource to supplement our own team in further investigating areas which Branch and Lee identified themselves following analysis of the interim final claim. In a financial climate where every penny counts, I would not hesitate to use their services again”. “Branch and Lee have recently spent 10 days working with us looking at maximising our subsidy claim. They worked in an unobtrusive and efficient manner, were clearly used to the systems they were using and identified a substantial saving”. “His understanding of the legislation surrounding Housing Benefit is second to none and I have always found his work to be of a very high standard. I would not hesitate to recommend Philip for work of this kind”. The objective of their work has been to examine and analyse Benefit information extracted from our processing systems. They have specialised on Housing benefit and Council Tax subsidy. We have found them to be highly skilled and effective in providing management information relating to Subsidy. Their work has been influential on providing accurate data. And as well as saving the authority a considerable amount of money, they have provided a number of important change processes before and during the Subsidy Audit process. We consider them to be a cost effective and reliable asset in realising the maximum amount of subsidy available. They have provided an economical support service that has substantially reduced our external audit costs”. “Last year Messrs Branch & Lee identified a potential area of subsidy loss from a quick review of our subsidy claim. Within five days of contracting them on a ‘no win / no fee’ basis they had completed an impressive exercise setting out necessary corrections and attracting considerable additional subsidy. Not only did this lead to a direct increase in subsidy for the Council, but we continue to reap the reward from the adjustments year on year. As part of the service, they provided a comprehensive report of their findings, supporting the adjustments that I was able to simply hand over to our auditor during our subsidy audit. The success of the exercise led me to speak to Branch & Lee again this year. This time engaging them to review the subsidy claim on a fixed fee basis, with particular focus on the area of overpayments. Once more, I am delighted with their work. They comprehensively checked a large proportion cells and values, identified areas of weakness and made recommendations for changes, all brought together in a clear and concise report. The service undoubtedly demonstrated value for money once again, with a financial return far outweighing costs. Add to this the invaluable tips and advice along the way, the comprehensive independent review and depth of claim validation and you begin to see what a professional service this is. I thoroughly recommend the service they provide”. “Philip Branch and Joram Lee initially worked with us on the grant claim for 2009/10. This claim related to a period following a system conversion and through the work they undertook additional subsidy of £133,780 was claimed through the reduction of overpaid amounts classified as Local Authority error. Additional work was undertaken on other cells where their extensive knowledge has identified potential issues may arise, and allowed for corrections to be applied to maximise the subsidy claimed. Philip and Joram also provided us with detailed reports of their findings at the conclusion of the project to support the audit processes. Given these impressive results Branch and Lee were invited to return in January 2011 to review the 2010/11 subsidy claim with us on a similar basis as that for 2009/10. Detailed reports were again provided and the outcome of this work is currently being reviewed and changes implemented where the work has identified shortcomings. “We engaged Branch and Lee in 2010 to perform a Pre-Audit check of our subsidy claim, which they were able to complete with the minimum of support from Hull City Council staff. Using their considerable experience, they identified the areas where errors were most likely to occur, determined optimum sample sizes, and conducted a thorough examination of those cases. The quality of the checking and attention to detail was first class. Results of the checking were clearly recorded and summarised, along with a comprehensive written report of the findings, with suggestions for improving processes and reducing subsidy loss in the future.